As an attendee of GoogleIO 2011, I waited patiently for June 15th when Google was going to start selling their first two (non-prototype) Chromebooks. Why was I waiting patiently? 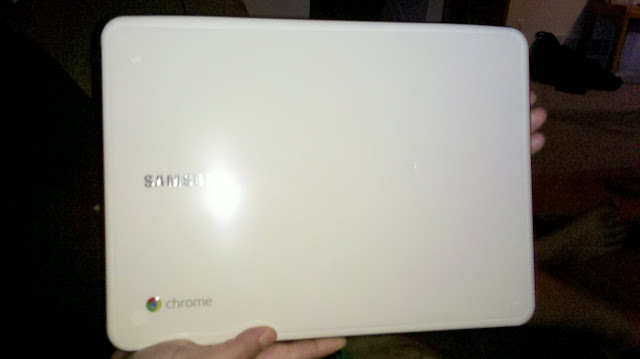 Because at the conference, they said that they were giving away a free chromebook to all of the attendees. Alas, June 15th rolled around and I didn’t have a Chromebook sitting in my mailbox. Thankfully Google did email everyone shortly after the 15th with instructions and a coupon code for ordering the Samsung Series 5 3G Chomebook (in Arctic White) along with a coupon for free 2 day shipping. Like a giddy schoolboy, I eagerly awaited the arrival of my new toy. Two days later, I came home to a laptop sized package. 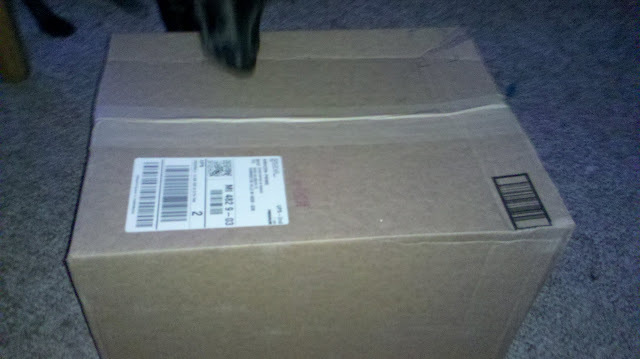 Inside said package was another box! 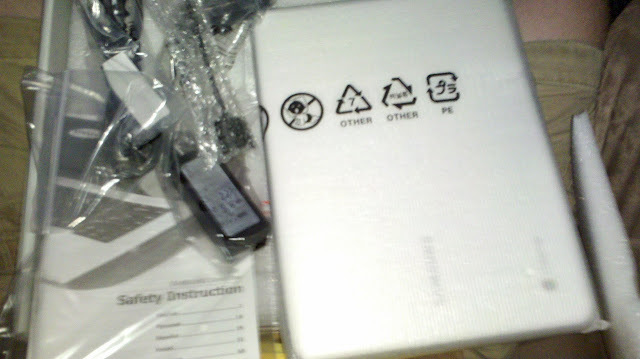 And inside of that box was a Chromebook, a delicious power adapter, some fire starters (manuals), and a VGA dongle. 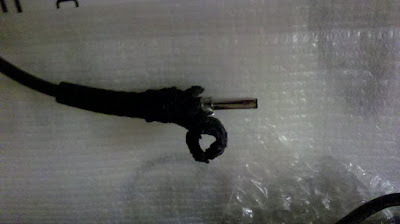 After pulling the Chromebook from it’s protective foam, I got my first look. The arctic white wouldn’t be my first choice in colors but it looks ok. The cover has been tagged with both Samsung and Chrome (with the Chrome icon). After looking through the packaging, it was finally time to boot up. So what is a Chromebook? Well if you haven’t watched the pretty humorous Chromebook commercial, it’s very similar to a Netbook. A netbook is a smaller (compared to most laptops but not the Macbook Air) laptop that’s primarily used for web browsing. 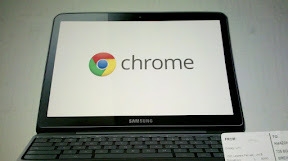 The primary difference between a Chromebook and a Netbook though is that the Chromebook is JUST a BROWSER. It’s like turning on a computer and only having Internet Explorer or Firefox or Chrome or Safari. There is no windows or mac boot up, no Microsoft Office, no notepad, no wordpad, no calculator. All you get is the Chrome browser. If you’ve used Chrome on your windows box or your macbook, you’ve pretty much used the ChromeOS system. There are a few additions for handling things like wireless connections and logging in (with your gmail account) but other than that it’s the browser. What does “Just a Browser” mean? With it just being a browser, there aren’t a lot of services to start up or connections to make every time you turn the computer on. That means that you go from a turned off computer to hitting the web in less than 10 seconds. Since you’re using the web, your documents and pictures and settings aren’t just on the computer. They’re safely in the cloud. If you throw your Chromebook in the river (I’m pretty sure they tell you to in the commercial) you can get a new one and not lose anything. What about installing updates and new applications? Updating the operating system is done for you automatically. New applications are just web sites. Anything you can get to on the web somewhere else, you can get to on your Chromebook. As far as security goes, nothing is foolproof. That being said, it looks like security was of paramount concern when they designed the Chromebook and it looks like through the combination of both hardware and software security, you’ve got a pretty safe system (provided no one breaks into all of Google’s servers). Again, it’s just like using a browser. Except that’s all you get. If you’re content with just browsing and doing the things you can do in the web (which are more considerable than most people know) it works great. One issue I ran into though was when I wanted to use a calculator. I asked a few people today what they would do if I asked them to pull up a calculator on their computer. No one says “oh I go to math.com” or “I just put 1+1 into google and it tells me the answer.” Without exception (I only asked a handful of people to be fair) they all said they opened the operating system’s calculator. With ChromeOS there isn’t (as far as I’m aware) a built in calculator. You do need to go to math.com (or another website) or just put it in Google search. Other than this, I didn’t really run into issues with basic computer use. The speakers were a little quieter than I’d like and I’m still getting use to the touchpad which is a little more advanced than I’m use to using (and seems to force you to get use to it). Not me. If you’re a developer, not you. At least not now. The majority of people could certainly get by with just Chrome OS. If they’re willing to buy into the Googleverse (i.e. put all their info into Google). It might require someone to move from Microsoft Word to Google Docs, but that’s not as hard as some people might think. And in reality, it deals with the problem many people don’t think about which is backing up their data. Old people would be able to get by on a device like this easily once you explain or convince them not to worry about their data being in the cloud. If you think you do things you couldn’t do in the web, take a serious look at what you really could do. Every day new web sites are coming out that start replacing the functionality of those apps we never thought you could do in the web. Why is the power adapter delicious? Clearly the power adapter is amazingly tasty. My dog proved it. Thankfully it still works. In addition, there are third party apps out there that can bridge the gap for Chromebook users that require occasional access to those tools found only in a Windows environment. For example, if a Chromebook user needs quick, easy, temporary access to a Windows desktop or Windows app, they can use Ericom AccessNow, a pure HTML5 RDP client that enables Chromebook users to connect to any RDP host, including Terminal Server (RDS Session Host), physical desktops or VDI virtual desktops - and run their applications and desktops and view all web sites in a browser. You can even use AccessNow to run Internet Explorer on a Chromebook for those companies or web sites that require IE. Ericom‘s AccessNow does not require Java, Flash, Silverlight, ActiveX, or any other underlying technology to be installed on end-user devices - an HTML5 browser is all that is required.